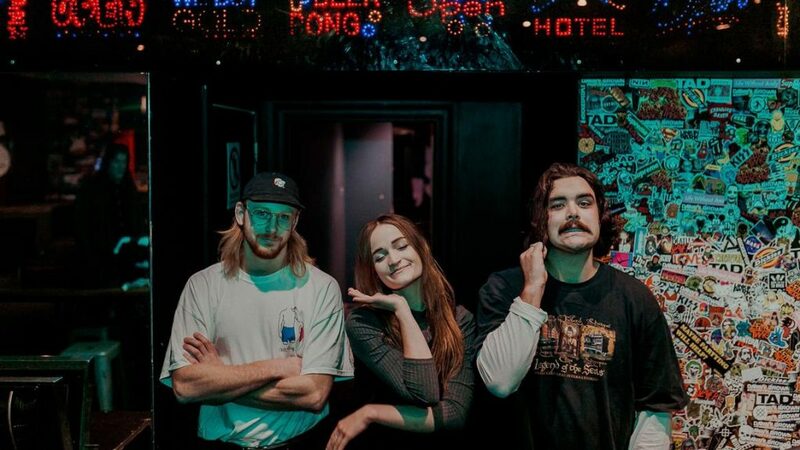 2016 triple j Unearthed ‘This That’ competition winners and Newcastle crowd favourites, RAAVE TAPES, have just returned with their raucous new single ‘k bye’ and announced national tour dates. They’ll be hitting up Transit Bar on Thursday October 26. ‘k bye’ tells a tale of adolescent debauchery, engulfing the listener in an atmospheric haze reminiscent of a suburban house party. Recorded in a Newcastle basement by close friends Fraser Marshall and Jack Clark, and mastered by Steve Smart at Studios 301 (Flume, Empire of the Sun), ‘k bye’ captures the raw energy of the Newcastle-based trio’s notoriously wild live shows. The band’s most recent single, ‘2 U xoxo’, garnered strong support from the likes of triple j, FBi, MTV, key Australian blogs and the Hype Machine blogging community. In between recording and releasing new music, the band have maintained a strenuous live schedule, playing Mountain Sounds Festival 2017 and performing alongside the likes of Hockey Dad, Winston Surfshirt, The Gooch Palms, Polish Club and Skegss to name a few. To celebrate the release of the new track, RAAVE TAPES will traverse the country in October performing in Brisbane, Perth, Sydney, Muswellbrook, Wollongong, Canberra and Melbourne, initiating new bassist Lindsay O’Connell into the band. The trio have also teamed up with local sponsors to produce a mini-festival in Newcastle on Sunday August 20, aptly titled RAAVE TAPES Shut Down The Argyle House, featuring twenty artists across three stages, including Good Boy, VACATIONS and Kwame. The accompanying music video and additonal tour dates will be released in the coming weeks.